Remember Time Crisis? Great fun wasn’t it? Yes, then Namco went a bit mental and attached half a PlayStation pad to the Guncom and we’ve never been able to look it in the eye since. So why haven’t the Wii or PS Move stepped in to fill the void with imitator shooters? Hell we barely even have any gallery blasters. Step forward young challenger, Heavy Fire: Shattered Spear. May the spirit of Virtua Cop be with you. We’ll forgive you for not having heard of the game, it was something of a surprise to us until a few weeks ago too. 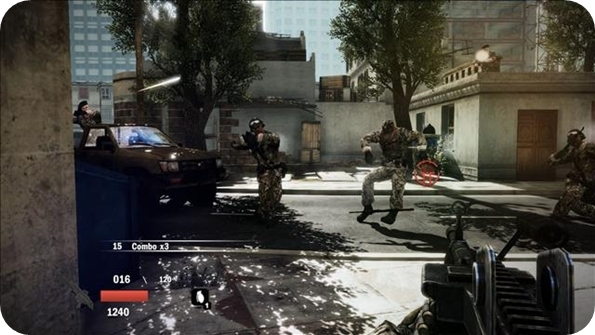 It’s an on-rails FPS, which can also be played with a control pad. But you really shouldn’t, it’s awful with a pad. The aiming is all over the place. It’s so over-sensitive it feels as though the crosshairs are attached to a hockey puck. However, if you have a PlayStation Move controller, you’re well on your way. Aiming is much better and targeting and shooting feels much more reliable. At selected points you can duck in and out of cover, with multiple directions often available. This is where I had to try various controller setups to find the best match. Playing with just the Move controller you hold the Move button and point in the direction of where you want to move into cover. It’s awkward and feels counter-intuitive when you’re planning on where to shoot when leaving cover. Next up, I tuned on the DualShock to use the left analogue stick to dive into cover instead. Annoyingly, the grenade button is also reassigned to the pad. If you have a navigation controller -I imagine it’ll need a charge first- it’s a lot better. How to really have fun with it though? Get a gun attachment for the Move controller. I finally had a chance to use Sony’s Sharp Shooter peripheral that I picked up for a tenner (originally released at £40) ages ago. This is a great match for the game as it’s assault rifle-shaped, like most of the in-game weapons. The navigation controller fits into the front of the frame and allows a natural position for your thumb to move you in and out of cover with reload buttons just to the side too. Shattered Spear is very much inspired by classic arcade shooters. This means that it’s on-rails all the way, production values are a bit low, weapon choice is automatic and enemies die easily. Seriously, you can shoot these guys in the foot once and they’ll die. Bullet fodder enemies are numerous and surprisingly good shots. The health bar can be topped up by shooting a health pickup if you’re eagle eyed and quick on the draw. Stages are liberally littered with checkpoints from which you will restart when you die. This can break a stage though, as you resume with the same amount of health as when you reached the checkpoint. This can mean a loop of death if there’s a tough section around the corner; I had to restart an entire stage a few times because of this. Rather than shunt you from one industrial estate to another, the game lets you enjoy lots of different locations. Okay, there’s a lot of sand involved, but you’ll get to experience the gunner seat and turret controls of a tank and even some COD-style AC-130 Hercules plane night missions where you protect a small group of troops against a small city’s worth of militia by smiting them from the clouds. Admittedly, there are a few issues that pop up throughout that will really make you grind your teeth. Quick time events that require a swing of the controller are really unresponsive and lead to a lot of instant-deaths. If you accidentally shoot one of your own troops you have to restart at the last checkpoint, and they’re constantly running out in front of you. They never shoot anything for you either, so their presence is utterly redundant. When you move (automatically) around a stage, the camera can be somewhat disorientating, lurching around the battlefield with all the grace of a new unicycle rider. Many enemies are really hard to see too because the game’s just too dark a lot of the time. Some enemies can only be spotted via their muzzle flash. As far as replayability goes, there are some easy Trophies available and Veteran mode unlocks at the end, giving you the same stages, but with more enemies to take on, which can be damn tough on your own, but that’s why you should grab a friend or three for the multiplayer. The game’s local multiplayer is a lot of fun and well worth replaying the game for and competing for the best scores is a great throwback to classic lightgun games of yesteryear. Everyone shares one screen with different coloured crosshairs for each player. However, all players can choose when to drag all of you into cover, which can mess things up a little if the others aren’t expecting it, but it all works out if you give them a little warning. Playing the game with friends may well be the difference between renting and buying it too, I’ll certainly be keeping hold of my copy for a while yet. 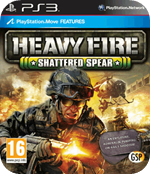 The Short Version: Despite the rough edges, Heavy Fire: Shattered Spear is a great on-rails shooter for any PlayStation Move owners out there. It really shines in multiplayer with an easy pick-up-and-play vibe that welcomes the most casual of player too.